The hubs celebrated his 66th birthday a couple of days ago. It was a real mile marker for him and just a wee bit harder to celebrate than some of the others. Sixty + Six. Official retirement age according to the United States government. The good news, you start receiving checks every month for the rest of your days (or so we hope). The bad news, your days are numbered – literally. Yikes! You can almost see the end of the tunnel, but you feel like you just boarded the train. You feel YOUNG – or at least not much older than 45 – which by your new age standard, is young. We Baby Boomers do not get old! That was never in the plan and we never saw it coming. We’re hip, we’re cool, we’re still relevant for goodness sake. We changed the world and we are not finished yet. Which is why my hubby and I chose to celebrate this milestone birthday by 1) Going out to buy a new pair of Keene sandals for our upcoming hiking adventures 2) Eating fresh Pacific NW oysters on the half shell, frog legs, and cajun catfish washed down with a Sazerac cocktail at EAT: An Oyster Bar and 3) laughing ourselves silly at Bingo & Bourbon with a room full of rowdy thirty-somethings. We were a little crazy and it was so much fun that we completely forgot to worry about be old. We just enjoyed the moment. 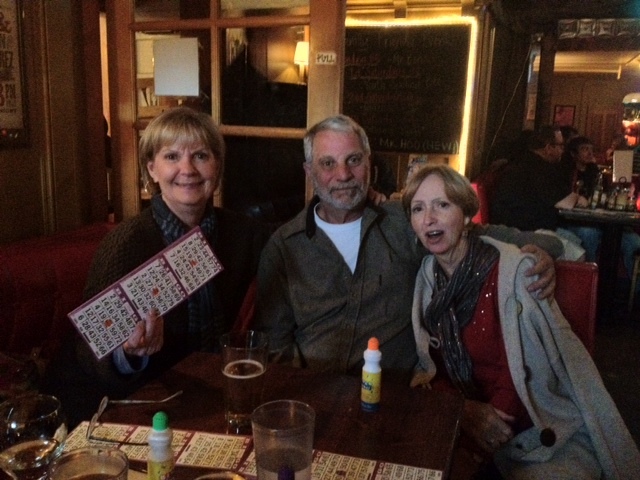 Of course, it was dark in there… so we needed our reading glasses to see the numbers on the bingo cards. I’m hoping we’ve all got a lot more crazy celebrations in our future. Party On! Wow! Sounds like a great birthday to me! Party on kids!!! Yes. Let’s all party for a long time. I understand Jim celebrated his birthday as well. Happy Birthday to Jim!